Deniz Baykal blamed a government conspiracy for the videotape. Istanbul, Turkey (CNN) -- Turkey's main opposition leader resigned as head of his party Monday after the circulation of a videotape allegedly showing him having an affair with a female party deputy who had once been his secretary. Deniz Baykal declared that "there is a conspiracy against me" and blamed the government for the video. The 71-year-old chairman of the Republican People's Party said the secretly shot tape could not have been made without the approval of the ruling party. "It is impossible to organize such a plot within such a short period of time without the knowledge of the ruling party," he said in a televised address. "One who gives credit to unlawful and unethical plots cannot defend law and ethics." The party is to elect a new leader at its convention May 23 and 24. Baykal has said he wouldn't be a candidate, but that won't stop members from trying to elect him again. Numerous party members are gathering signatures from delegates to renominate him as a candidate for leadership, saying they do not believe the accusations. 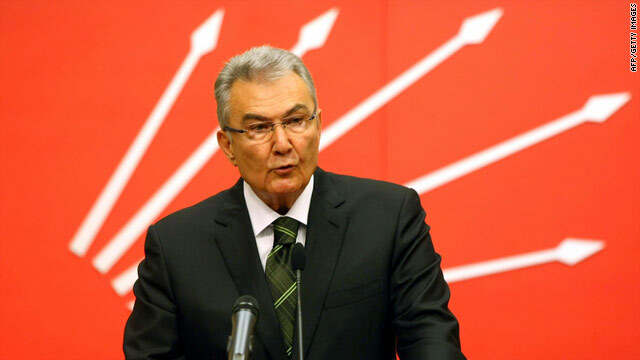 And Baykal said, "My resignation doesn't mean I will give in to this conspiracy or will stop the fight." Members of parliament wept openly during the speech by Baykal, a representative from Antalya. Afterward, Prime Minister Recep Tayyip Erdogan said he had ordered distribution of the tape halted. He added that he found Baykal's statements "just as ugly and worthless as the tape" and noted that Baykal had not denied its authenticity. The resignation of the secularist party leader comes as the government is preparing to take a package of proposed constitutional changes to a national referendum. The Republican People's Party opposes the changes. The chief prosecutor's office in Ankara has initiated a criminal investigation, according to Turkey's semi-official news agency Adnadolu Ajansi. CNN's Yesim Comert and Talia Kayali contributed to this story.